White cut chicken or white sliced chicken is a type of siu mei. Unlike most other meats in the siu mei category, this particular dish is not roasted. The chicken is salt marinated and is cooked in its entirety in hot water or chicken broth with ginger. Other variations season the cooking liquid with additional ingredients, such as the white part of the green onion, cilantro stems or star anise. When the water starts to boil, the heat is turned off, allowing the chicken to cook in the residual heat for around 30 minutes. The chicken's skin will remain light-coloured, nearly white and the meat will be quite tender, moist, and flavourful. The dish can be served "rare" in which the meat is cooked thoroughly but a pinkish dark red blood is secreted from the bones. This is a more traditional version of white cut chicken that is seldom served in Chinese restaurants anymore. The chicken is usually cooled before cutting into pieces. The chicken is served in pieces, with the skin and bone, sometimes garnished with cilantro, leeks and/or a slice of ginger. It is usually accompanied by a condiment made by combining finely minced ginger, green onion, salt and hot peanut oil. Additional dips can be spicy mustard, hoisin sauce, soy sauce, oyster sauce, or chili pepper sauce. 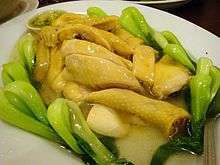 The dish is common to the cultures of Southern China, including Guangdong, Fujian, and Hong Kong. In all cases it is served with a condiment called jīang-rōng (Chinese: 薑蓉; Jyutping: goeng1 jung4) or jīang-cōng-yóu (Chinese: 薑蔥油; Jyutping: goeng1 cung1 jau4), which is a salted mixture of finely minced ginger, scallions, and either liquid pork fat or vegetable oil. 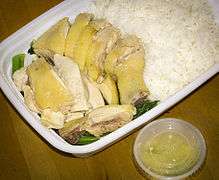 Wikimedia Commons has media related to White cut chicken. 1 2 Xinhuanet.com. "Xinhuanet.com." 白切雞. Retrieved on 2008-11-19. ↑ 39World. "39World.com." 白切雞. Source mention 闽南, which is basically Minnan/Fujian. Retrieved on 2008-11-19.